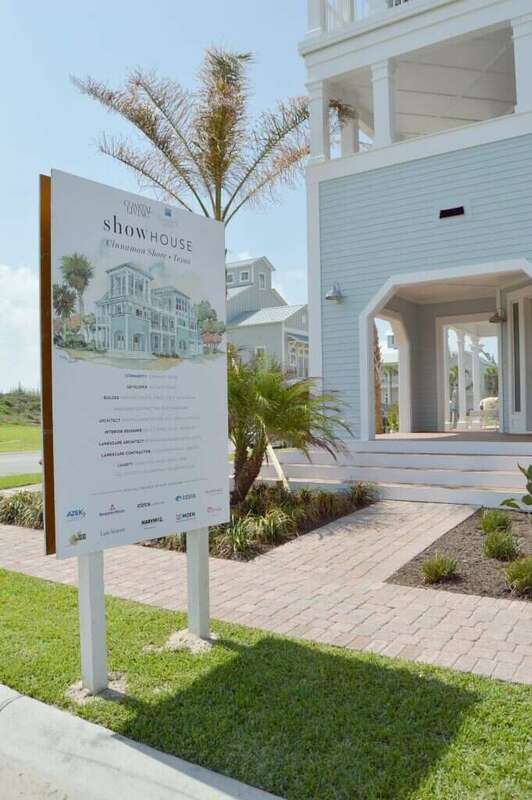 Welcome back for Part 2 to my tour of the Coastal Living Showhouse located just up the coast here at Cinnamon Shore in Port Aransas! If you missed it, check out Part 1 where we perused the first floor den with its awesome wallpaper and its two fun bunkrooms with super cool bathrooms. Today we’re headed upstairs to see the remaining second and third floors which include the main living room, kitchen, and two master bedrooms. 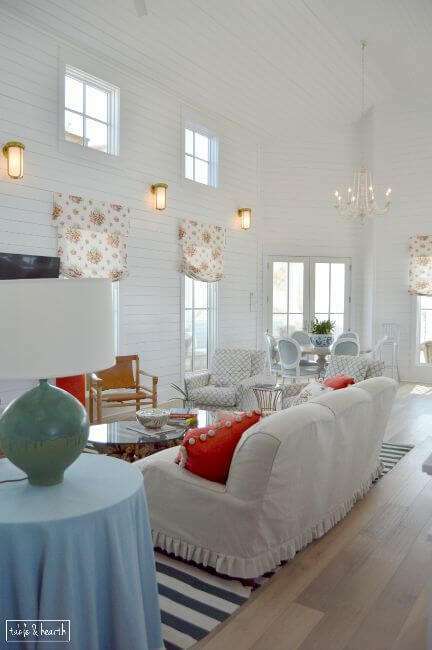 How can we forget the gorgeous shiplap walls everywhere?! The living room has soaring ceilings and is open to the kitchen. 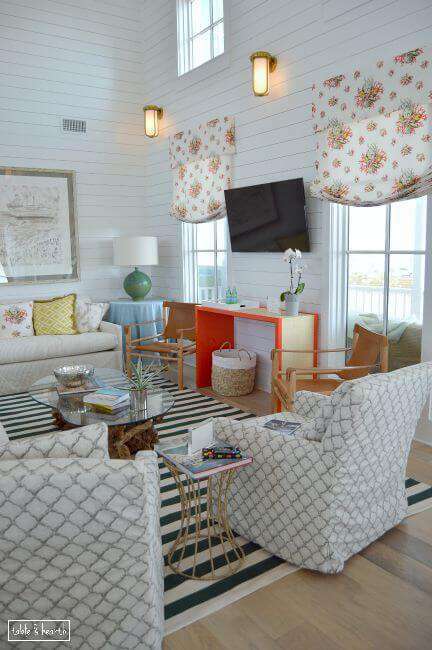 I really liked how the color scheme in here is not the usual coastal pastels, but rather pops of dark green, yellow, and coral red pulled from the gorgeous fabric on the roman shades. 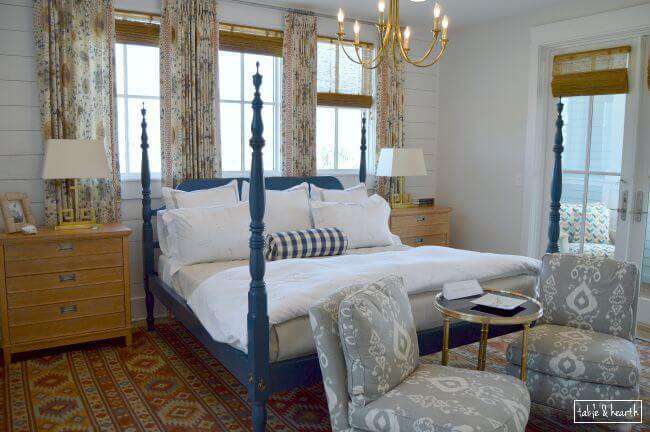 Those red pillows had tassels made out of little tiny monkey fist knots :) And those brass sconces…be still my heart. The kitchen isn’t huge but feels so spacious being open to the living room and having the white cabinetry, white quartz waterfall island, and open shelving. Again, they pulled in the dark green color from the roman shade fabric in the wall of tile. 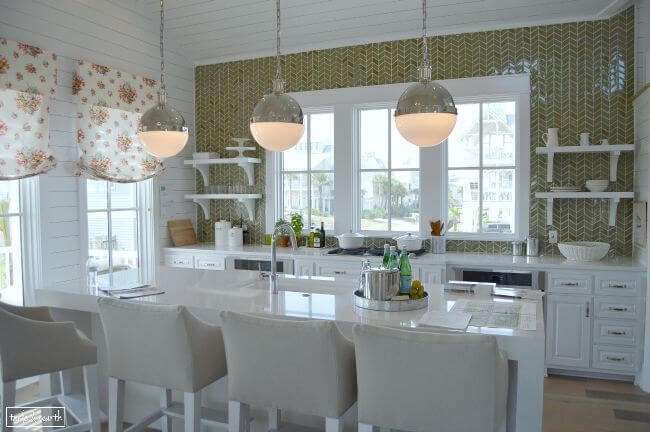 The use of tile in this house was awesome. Heading out the french doors at the back of the living room brings you to the second floor wraparound porch with a ton of comfy seating. You can see right over the dunes and out to the gulf from this level and the whole living room and kitchen have that view. Back through the living room. Look at all those patterns and textures, but how they all work so well together! How badass are those leather chairs ?! 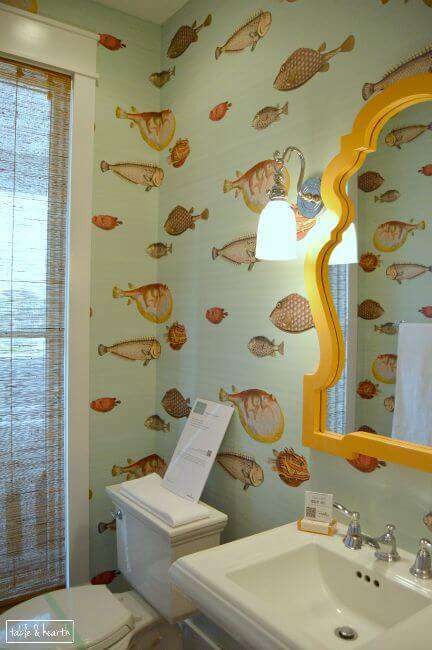 Just past the living room is this adorbs powder bath, with some of the coolest wallpaper I’ve ever seen. This marine biologist was fa-reak-ing-out in here!!! We’re up to #2 in wallpaper amazingness in this house BTW. And yet another big laundry room on this floor. 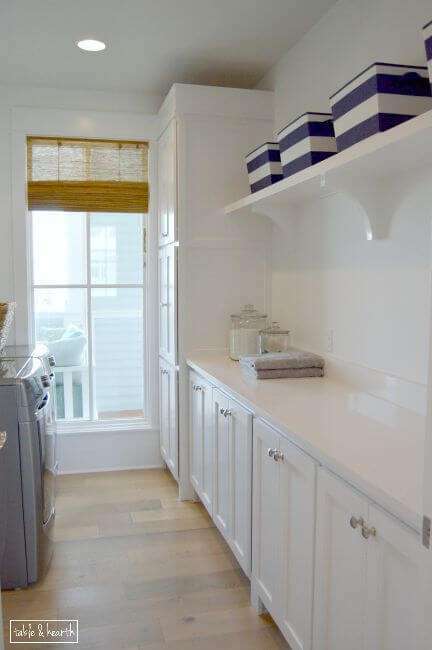 Because you can never have too many laundry rooms. Then, at the end of the second floor hallway, is this guest/master bedroom. There are technically two masters in the house. but this one was my favorite. Again, while I luuurrrve me some coastal neutrals and pastels, it’s also refreshing to see a warmer and more rich color palette in here. 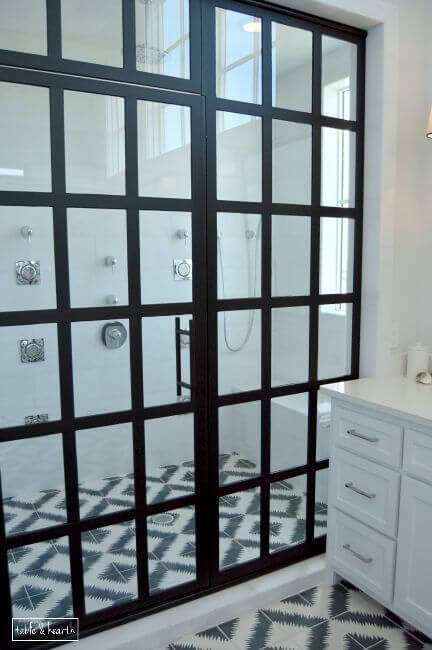 And this shower y’all!! There are no words. 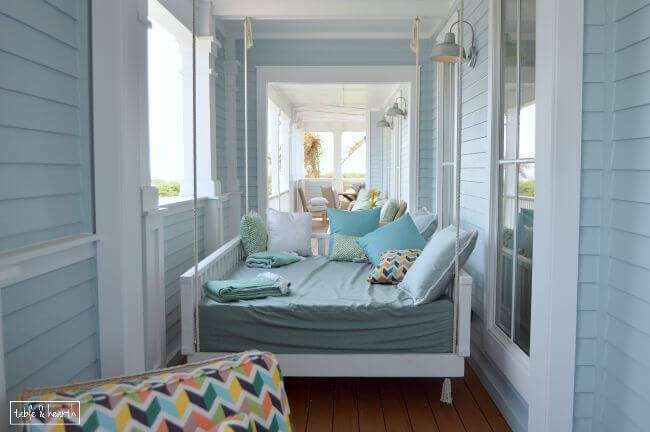 I finally peeled myself off that tiled floor and headed out to the porch off of the room where this hanging daybed is. If I lived here I would just go between that bathroom and this bed all day long. 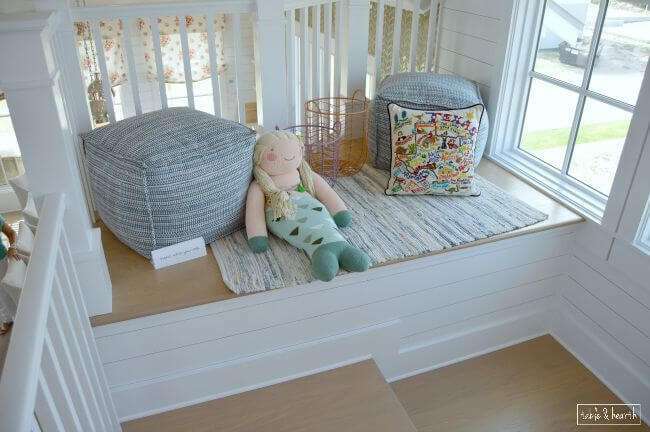 Now, up to the third floor to see the last bedroom, but a pit stop at the landing for this cute little seating area overlooking the whole second level. LOVE that mermaid. And that Texas pillow. I totally would have camped out at this thing as a little kid. Ok, now to the second master on the third level! Hello beautiful wallpaper #3! 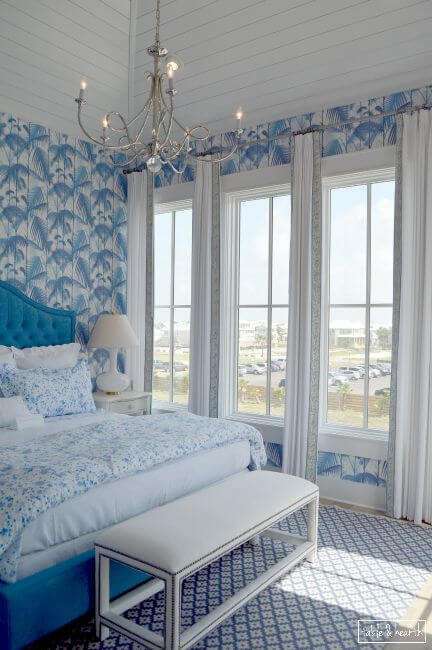 This was ALOT of blue, and I’m not even a blue person, but the wallpaper was gorgeous, the ceiling was gorgeous, and those windows were gorgeous. I’d also love to have that nailhead bench for our master but it’s a bit too white for our feline roommate. 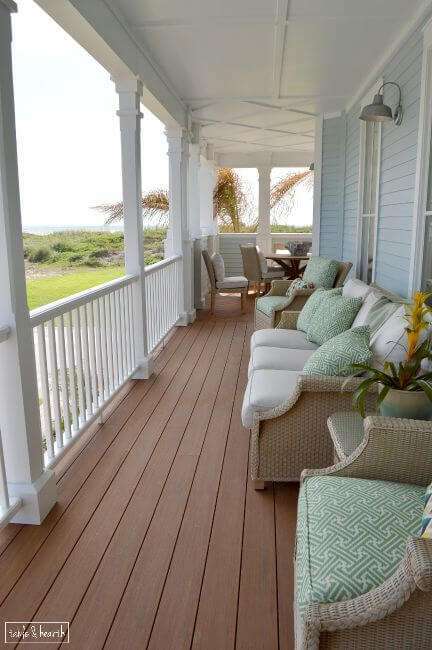 Just to the right of this pic is a door that leads to another porch (of course) overlooking the gulf. Definitely a view that’d be nice to wake up to everyday. While there are technically two masters, this one eeeks just a tad ahead of the other (its badass bathroom aside) because it has a bar in it! 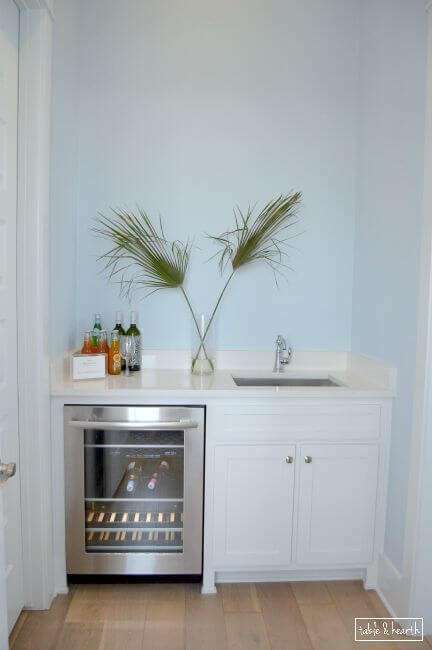 New goal in life: have a bar in my bedroom. Just to the right of the bar is the bathroom in even more blue glory. 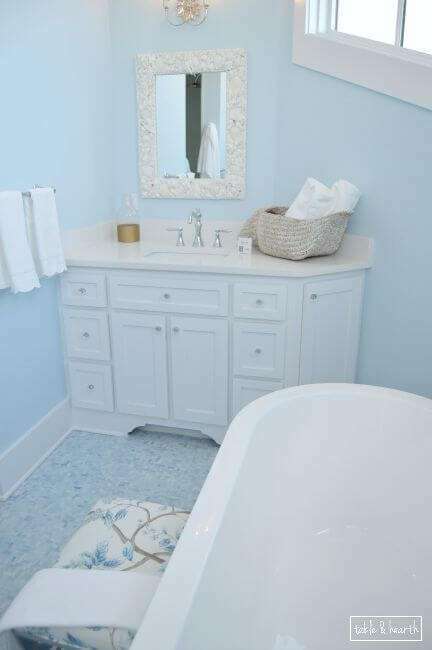 It was laid out like an arrow with a hallway containing the shower and closet, then a triangle-shaped room with two vanities at each corner and a free-standing tub in the middle. Super hard to photograph but I’m sure you can tell how gorgeous it is. The house is amazing and the team that pulled it all together is a seriously, seriously talented crew. So many fun spaces and unique ideas, I bet it was absolutely amazing to be a part of. I’ve always ogled at Coastal Living showhouses in the magazines and am still pinching myself that I was able to actually see one in person. It’s nice to see good, true, serious interior design around here and I wish I could go tour more like this to share with y’all more often! So, what’s your favorite part of the home? Mine is (obviously) a tie between the flamingo wallpaper and the second bedroom’s bathroom tile. Although that hanging bed on the porch is a close runner-up! 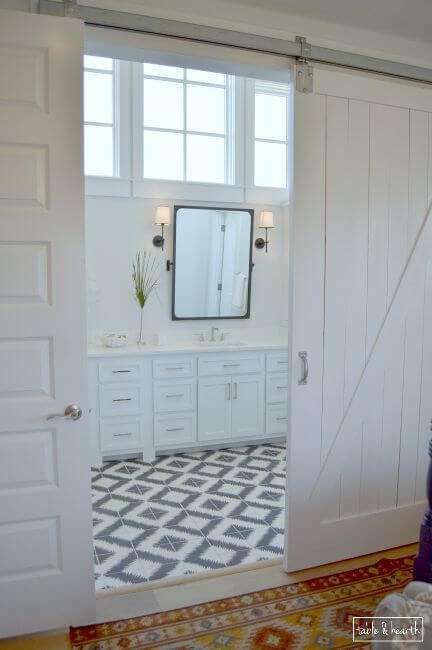 My favorites are the kitchen tile and the black and white bathroom floor tile. I’m a sucker for fun tile! Oh me too Corinna, they were awesome! I loved the entire tour! 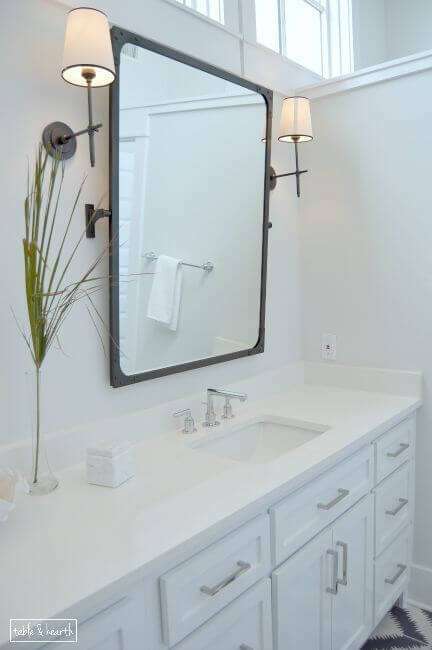 So much inspiration but the bathroom is probably my favorite (that tile)! Thanks for linking up to this month’s Pretty Preppy Party! Oh man, I know right?!? I seriously went back in there like four times. So amazing. Thanks for another awesome PPP Sarah!! 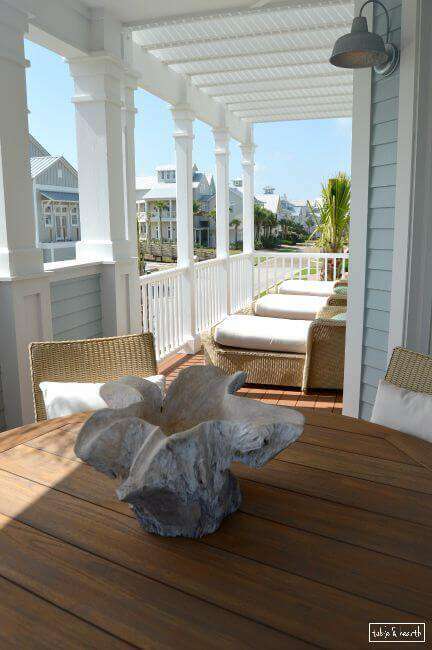 I loved visiting the Coastal Living Showhouse! 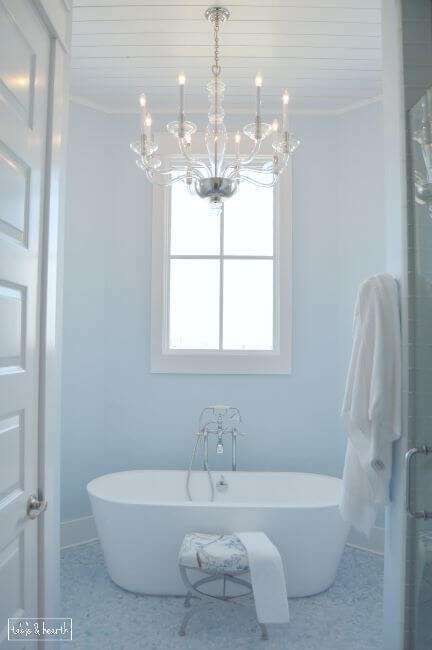 The tile in the bathroom with the free standing tub was gorgeous! Right! Also loved the walls… I need some shiplap somewhere! everything here is beautiful! I especially love the mermaid lol. found you over at DIY like a boss linkup! It was an amazing home!! Thanks so much for linking up with us! !